There are many different stories as to how Valentine’s Day came about. 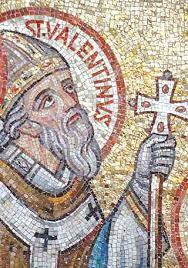 The first theory is based on Christianity and the Catholic Church is about a priest known as Valentine during the reign of Emperor Claudius II. Claudius had decided that single men made the best soldiers so he outlawed marriage for all young single men. It is thought that Valentine did not approve and he started marrying young lovers on the sly. When the Emperor discovered what he was doing he ordered his execution which made him a martyr. Another story for this theory is Valentine was imprisoned for trying to help people escape Roman jails due to Christian persecution. While he was imprisoned the jailer’s daughter would come visit him and they fell in love. They would then start sending each other letters and it is said that he would sign them “From your Valentine”. The second theory is based in Paganism. The Pagans celebrated with a feast on February 15th that was called Lupercalia and was meant to increase the fertility of women. Priests would sacrifice a goat, they would then skin the hide of the goat and cut it into strips and dip it in blood. They then would walk through town gently slapping women with these strips to increase their fertility. As the day came to a close the young women of the town would have their names placed in a big urn and the bachelors of the town when then take one. Many times the matches ended in marriage. This tradition was outlawed in about the 5th Century when it was deemed “un-Christian” by Pope Gelasius. But the popularity of Valentine’s Day came about during the 17th Century, by mid 18th Century friends and lovers commonly exchanged handwritten notes to each other. With the invention of the printing press cards were then manufactured in the 1900’s. In America the “Mother of the Valentine” was Esther A. Howland when in the 1840’s she started making elaborate hand made cards that were made of lace, ribbon, and scrap (colorful pictures). Today we as American’s purchase an estimated 1 billion cards, with 85% of the people purchasing the cards being women. << Previous PostDid you know???? ?